Meatless Monday Round-Up 4/2 Nutrition Special Edition! Getting an early start on my Meatless Monday round-up this week..
Today's Meatless Monday Recipe Round-up via my posts over at Babble's Family Kitchen include a slew of nutrition-focused recipes and round-ups! 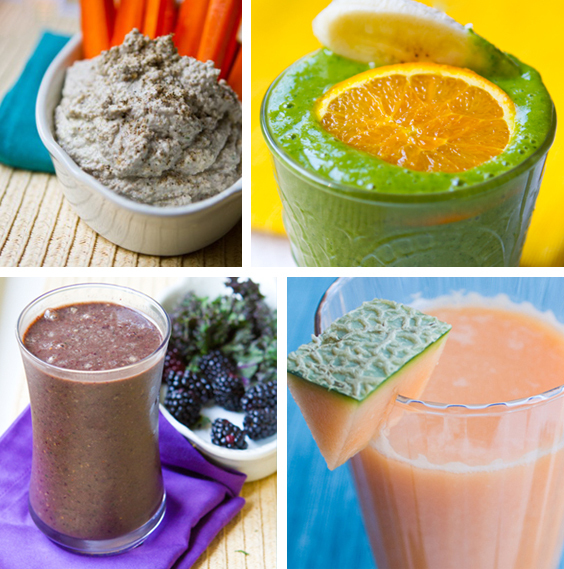 .. a purple power-up smoothie, alkaline recipes, vegan treats for spring round-up, vitamin-rich recipe round-up with nutrition tips, a vibrant green smoothie, mango-avocado superfood quinoa, raw cashew dip - Get these recipes and more inspiration for your healthy Meatless Monday and the week ahead!.. Starting off this round-up with my favorite way to boost nutrition in a flash. Or a chug. Green Smoothies! Not all green smoothies have to be green. This energizing sip is filled with greens and berries to rev up your day and fill you with nutrients! Reducing inflammation in the body is as easy as watching what you eat and being aware of food pH levels. Here are 11 high pH foods (alkaline) that will help you alkalize your diet and possibly improve your total wellness in turn. Blueberries, kiwi, greens and cayenne make up this tasty green zinger smoothie. Switch out your AM coffe for this energizing sip. Students, freelancers, stay at home parents and more all work (and eat) from home. I'm sure we've all experienced this at some point in our lives. Well if you do find your office just a hop away from the kitchen you may think it is a challenge to keep a healthy diet - and wellness in mind. Get my 7 healthy tips for embracing nutrition and wellness - and reduce stress - as you work and eat from home. I'm a huge fan of romaine lettuce. And sometimes I think it can get lumped into the "green lettuce category" right next to Iceberg. Well I want to show you just how much healthier Romaine is than Iceberg. Plus recipes! My Ode to Romaine.. Step into class folks, it is time for a little nutrition 101. Refresh your mind with why our bodies need certain nutrients like vitamin C and D - and you just may be inspired to eat a little healthier this week. 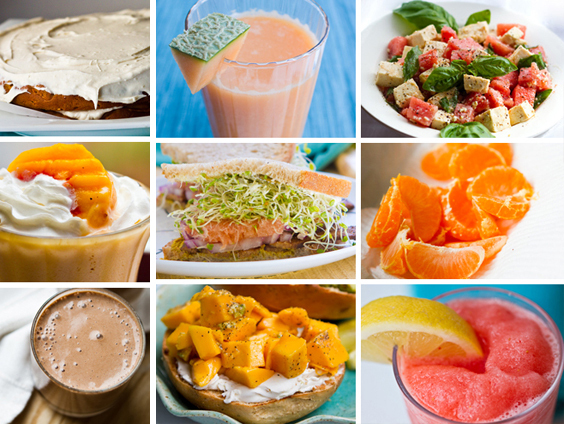 Plus recipes for that specific nutrient you crave! 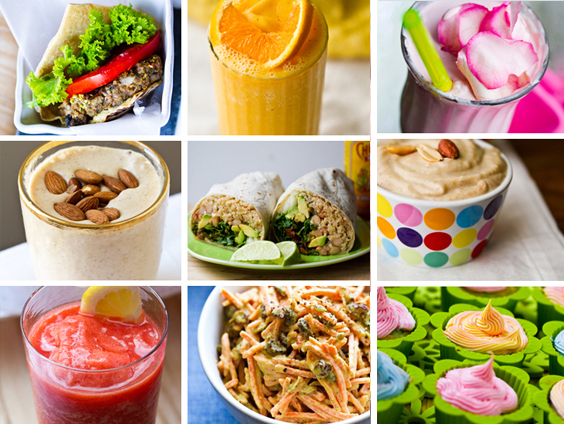 If it is vegan treats and desserts you crave this spring - I have 16 of them for you! Vibrant green smoothie made from whole foods - fruit and veg. Sassy and sweet. Grab this cooling zesty sweet pink sip and step into springtime. Pairs perfectly with a vegan fiesta dinner! This dish was made from my leftovers from a fiesta dinner. Sassy mango, creamy diced avocado meet fluffy superfood quinoa. Serve as a colorful side dish or top with tofu, tempe, beans or mushrooms for a hearty main course. This creamy - yet chunky raw cashew dip is a staple for spring. Flavor it however you'd like and pair with fresh-chopped veggies for an instant perk-up snack! Also! 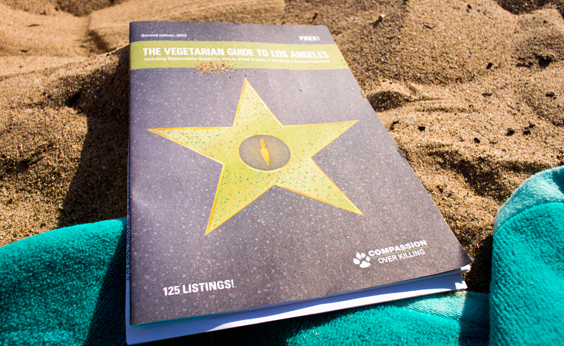 If you live in Los Angeles be sure to get your FREE copy of Compassion Over Killing's "Vegetarian Guide to Los Angeles" - I read it front to back at the beach and loved it! Lots of dining out info in here - neighborhood based guides! Order your copy online. About my Meatless Monday round-ups: Every other week I link to all my posts over at Babble.com so that you don't miss out on any of my recipes. 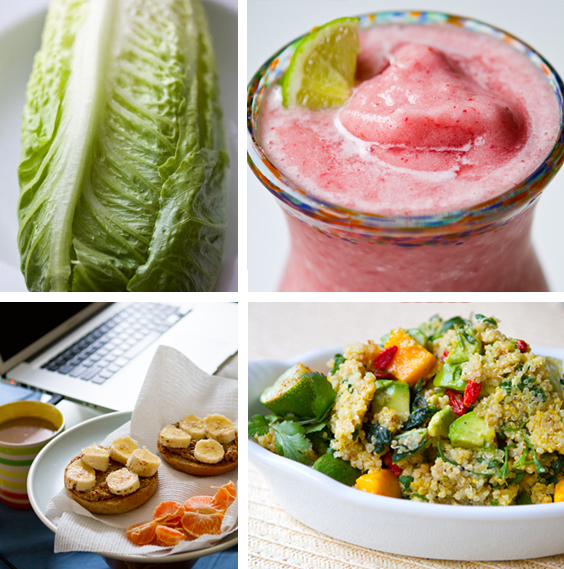 My round-up is a great way to embrace Meatless Monday. * 3/19 - Green Cashew Cheese, Cupcake ATM fun, Smoothies, green smoothies, vegan St Patty's Day eats, chocolate peanut butter cupcakes. * 1/9 - Cocoa Peanut Cookies, Apple Pancakes, Cheezy Leek Chow Mein, New Year's Detox..
* 12/20 - Holiday Edition! * 12/12 - Vegan Cheese, potato stew, cardamom chocolate cake and more. * 11/28 - Post-Thanksgiving Meatless Monday recipe. * 11/14 - Pre-Thanksgiving Meatless Monday recipe. * 11/7 - Pumpkin Cheesecake, BBQ Chickpea Wrap, Easy Spicy Chick'n Ranch Wrap, Concord Cranberry Sauce and more! * 10/31 - Halloween Bonanza - treats, sips, and more..
* 10/24 - Banana Pecan Muffins, Halloween Candy Veganized, Halloween Cupcakes. * 10/17 - Papaya bowl, witches brew broccoli cheesy soup, cheezy broomsticks, Spiderweb Brownie Bites, Tofu Triangles over couscous with candied cashews and broccoli. * 10/10 - Pumpkin Pizza, Fruity Faces, Peanut butter Banana Pudding, Carrot Juice and Double Pumpkin Cream Pie. * 10/3 - Naughty/Nice Vegan Desserts, Raw Chocolate Shake, Pumpkin Potato Salad, Pumpkin Spice Cider Smoothie and more..
And you can always peruse my HHL Recipe Index for many more vegan, meatless recipes! For more "get healthy" inspiration check out this year's Veggie Girl Power Series. And catch-up on past interviews here: 2009 and 2010 and 2009 quotes.